Rusty is a native Alabamian who grew up in the Hoover area. After completing high school Rusty furthered his education by attending Jefferson State Community College where he received an Associate Degree in Criminal Justice and then went on to graduate from the University Of Alabama’s Law Enforcement Academy. 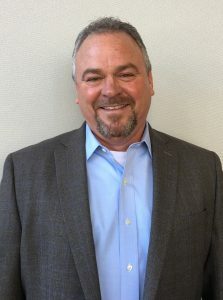 Rusty began his 32 year career with Nichols Concrete Equipment in sales and worked his way up to the position of President and COO, which is the role he has served the company for the last 15 years. Rusty is an active church member with a passion for reaching people around the world with Gospel message of Jesus Christ. In 2011, the passion for missions grew even stronger and Rusty enrolled in The Highlands College, a local ministry training school. After graduation, Rusty has gone on to lead and support numerous mission organizations locally and around the globe. Rusty currently lives in Alabaster with his wife Jeannette. They have been members of Church of the Highlands since 2007, where they both love serving, and Jeannette serves on staff as an Executive Administrator. When they are not serving their church or leading mission trips, they spend their time with family, friends and playing with their two grandchildren.